Click here for Merav Richter’s Speaker Kit. Click here for Merav Richter’s Press Kit. Contact to inquire about bookings. See Merav on The DYNAMO Show in September 2017, where she is interviewed by show host, James Erdt, Chief Architect of WOW for DYNAMO Entrepreneur, who talk to visionaries, thought-leaders and game-changers who are ‘Living Well & Doing Good’ in their communities and around the world. In September 2017, Merav was interviewed by HayHouse Radio as part of their show called Bright New Voices that discovers exciting new book authors waiting to be heard. She is interviewed in their segment “The Journey To Living An Illuminated Life”. Click the image below to listen to the radio segment. Watch Merav’s video of her on-stage as one of the selected speakers at the August 2017 “Speaker Slam Toronto” – where she won the Judge’s Choice Award. Merav Richter is the vivacious hero for brave ecstatic living. 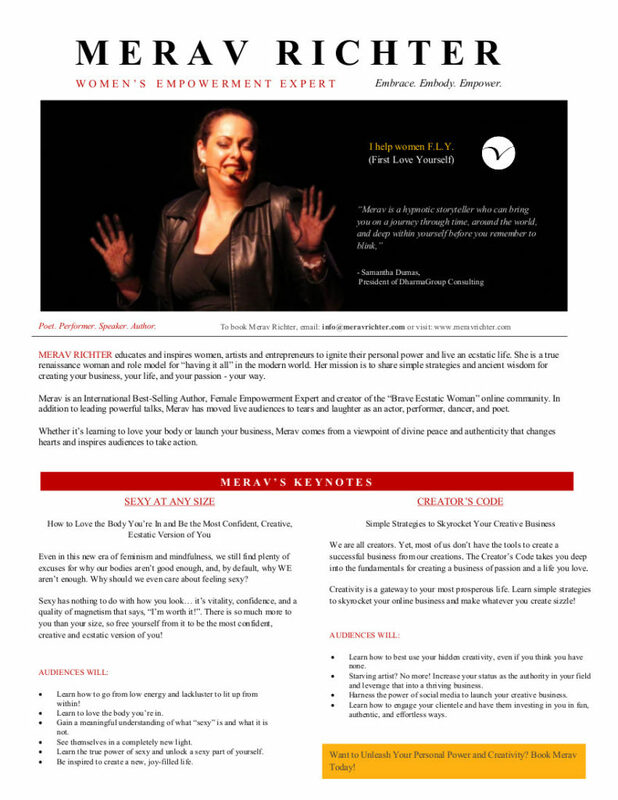 Best-selling author, career woman, entrepreneur, philosopher, mystic, poet, dancer, traveler, adventurer, comedian… In today’s fast-paced, success-driven world, Merav is championing a new standard in personal fulfillment – ecstasy! Available for speaking engagements worldwide on the topics of Feminine Empowerment, Social Change, Spirituality, Creativity and Ecstatic Living. Through her hypnotic storytelling, inspiring personal journey and wealth of sacred knowledge, Merav Richter moves audiences to embrace their own personal power for the ultimate fulfillment and success in the modern world. Enlightening and motivational keynote talks begin at $2,000 USD. Speaking fees are flexible for events in support of a moral cause or charitable organization.